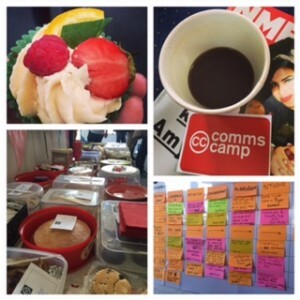 I spent today in Birmingham with a load of comms, digital, marketing and generally interesting people at CommsCamp15. It seems to be the done thing now to jot down a list of quick reflections on the and that seems like the perfect way to capture my busy thoughts right now. Before that though – a big thanks to Darren Caveney, Dan Slee, Emma Rodgers and the sponsors for making the event possible. It takes a ton of work to pull together an event and I’m always grateful when there are people who put in the effort (and/or the cash) to make stuff like today happen. Building a collaborative playlist is a really nice way to get into the spirit of the event and I loved hosting it, and playing from it on Spotify. I’m going to leave the list open so if a communications-themed song pops into your head add it to the playlist, or listen to the 6 hours and 57 minutes of music already in there! Likewise, having people bring cakes and then share in the bounty (for charity) is a great way to build community and break the ice (also, encourage early onset diabetes). Kate Bentham should definitely consider changing her name to Cake Bentham for her excellent hosting of the cake table. Unconferences are still as much (or possibly more) about the corridor conversations and catch ups as they are about the sessions. That said, the dichotomy of choice is a real one at unconferences and there were times when I wished I could be in two places at once. A few women took up Emma Rodger’s rally cry for more women to pitch sessions – not sure what the gender split was today but her post encouraging more women to make suggestions and facilitate discussions is well worth a read. My session was a shameless misappropriation of a Batman quote: ‘Your intranet could be the hero your organisation deserves, but it’s not the one it needs right now’. I have seen a lot of chatter around intranets recently (including internally as we continue through our own discovery phase). Most of it is focused on delivery of a ‘thing’, or seems to start with the solution (‘let’s build a shinier intranet’) and doesn’t acknowledge that success is going to come down to deep understanding of your organisation’s culture (good and bad bits) and building something that fits with it, or is a step on that way to the culture your organisation wants. It was great to do this as a co-host session with Dan Slee who pitched ‘my intranet is worse than yours’. There were some really quite remarkable examples, not least because the delivery and approach was likely speaking of that organisation’s culture too. always start with a problem looking for a solution, rather than the other way around. First up – when I said ‘I’m a digital person, so not really comms’ I think it came out a bit wrong. The word digital means a great many things, and only one of them is about a communications channel. The way I self-identify what I do isn’t restricted to that definition. My digital is as much customer service, service delivery, service design and user experience – all of that involves communication, but isn’t Communications (subtle but important difference to me). Leadership doesn’t have to come down a hierarchy, it doesn’t even have to come from within your own organisation. You can choose who you allow to lead you. You are a leader yourself. Find who inspires you. Can’t find anyone? Inspire yourself. The future is uncertain – digital is massively disrupting established models all over the place as well as all the other budgets, reorganisations etc that are going on. To get us to a new future (or move us along in this change) someone has to be first, and they have to be brave and accept that means there won’t be the comfort of someone already having scouted ahead or checked out the potential pitfalls. It’s still red pill / blue pill time for a lot of people. And don’t think that because you lose a battle there isn’t a longer war to be won. Procurement comes in cycles, contracts renew. Be positive and proactive when you are defeated and prototype and find evidence for the future decision to be a better one. I’m still really excited about delivering Digital First at Nottinghamshire County Council. It’s all about seeing the opportunity that is hidden within each challenge and making the right choices (even when these aren’t the easy ones). I’m still in love with possibilities and all about the people, not the tech. Great conversations with @lilac_lou, @joomoohoo, @albfreeman and @x333xxx. Thought provoking, motivating and generally lovely. My favourite cake was the Pimms cup cake by Kelly Quigley-Hicks. Deliciously genius. Eddie Coates-Madden and Nick Hill are heroes for taking on the organisation of LocalGovCamp for this year – I have every faith that it will be superb! It was great to do a speedy handover and checklist of what’s to do – the baton passes and there is something rather nice about it happening while we were all at another grassroots unconference. The Digital First blog is here and the beta site is here. Posted in Events, local government, online communications.Tagged #commscamp15, communications, future communications, future leaders, intranets, leadership. Looks like that Future Comms Team session was brilliant. I wish I’d gone to that one now. Thanks for writing about it, makes me almost feel like I was in that one after all. Glad to be useful Albert 🙂 It was a great session with lots to think about from a personal and individual professional viewpoint, but also organisationally, and as a sector! I’m still reflecting on much of the discussion and think I will probably blog in more detail on my thinking soon. Previous Post Press play: CommsCamp collaborative playlist is go!